I help an elderly man named Bob in the neighborhood with his grocery shopping at Key Foods on 7th Avenue in Park Slope, Brooklyn. He's quite finicky, and devoutly sticks to a select few brands of food items. Over the last 40 years in this neighborhood, Bob has refined his taste, and knows exactly what he likes and dislikes. He doesn't like Wise, claims they are the worst chips ever, with a far higher "brown spot" ratio than most other brands. And forget chips with ridges, they hurt his gums! So when it comes to Potatoe Chips ONlY 99¢, Bob insists of Utz Onion & Garlic. But if Bob could only see this sign, he might just go for the Wise. Wise chips may be crap, but their Cheez Waffies are a sodium lover's heaven! 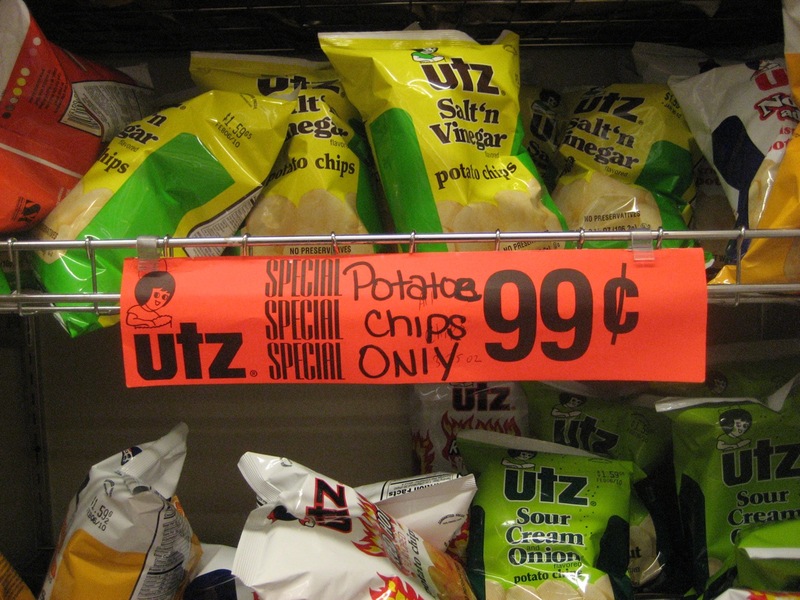 I love that the sign writer went over the "e" in "potatoe" multiple times so that it really stands out. Nice job!